This post is brought to you by Ronald McDonald House Charities®. All opinions are my own. As a mom of a preemie who spent 13 days in the NICU after his birth, Ronald McDonald House Charities is an important organization to me. While I didn’t personally stay in a Ronald McDonald House, I know many families who did. Without that valuable resource, they wouldn’t have been able to stay close to their baby. Trust me, I know how difficult that is! I couldn’t stay close to Jake. My own post-operative complications forced me back to my home town (and doctor) 40 miles away. I traveled back and forth almost every day when I had rides and called every hour when I wasn’t there. If my complications didn’t keep me away, I would have stayed in the nearby Ronald McDonald House. Ronald McDonald Family Rooms: They offer a peaceful place to rest and regroup at hospitals. While facilities vary depending on the hospital, families will often find a kitchen area, showers, laundry facilities and sleeping rooms. Each day, the Ronald McDonald Family Room program, provides a place for families to relax, regroup and regain the strength they need, while allowing them to stay just steps from their child. Ronald McDonald Care Mobiles: Think of them as mini healthcare facilities on wheels. They service children in vulnerable areas where medical care is seriously lacking; from across the globe in Western Europe to right here in the United States, there are 50 Ronald McDonald Care Mobile units in 9 countries and regions. The Care Mobiles bring much-needed services like dental care, vision services and vaccines. Ronald McDonald Houses: I know I mentioned them above and we all know about them already, but I wanted to make sure families know one important fact: you DO NOT have to pay to stay at the Houses. While they ask for a donation, you’ll never be turned away if you can’t afford it. Ronald McDonald Houses are all over the world, in fact there are 347 Houses in 38 countries and regions. Each night, the Ronald McDonald House program provides a “home away from home” to thousands of families so they can stay close by their hospitalized child. This proximity helps families participate in important medical decisions and allows them to connect and heal together. Are you surprised to find out all the different things RMHC does? I know I was! It really is an extraordinary organization. The fact is the first Ronald McDonald House was inspired by a family’s struggle to stay together while fighting their child’s devastating illness. Today, the program has grown to 347 Houses and has a volunteer network of more than 300,000. The bottom line is, they help families stay together and close by their children when they are receiving treatment. Supporting Ronald McDonald House Charities is as easy as heading to your favorite McDonalds location and buying a paper heart for $1, $3 or $5 from now until May 10. Jacob LOVES McDonald’s nuggets, so we eat there once a week. For about the cost of one extra item (or value meal), you can help provide stability and vital resources to families so they can get and keep their child healthy and happy. All proceeds from the donations go straight to the Ronald McDonald House Charities. 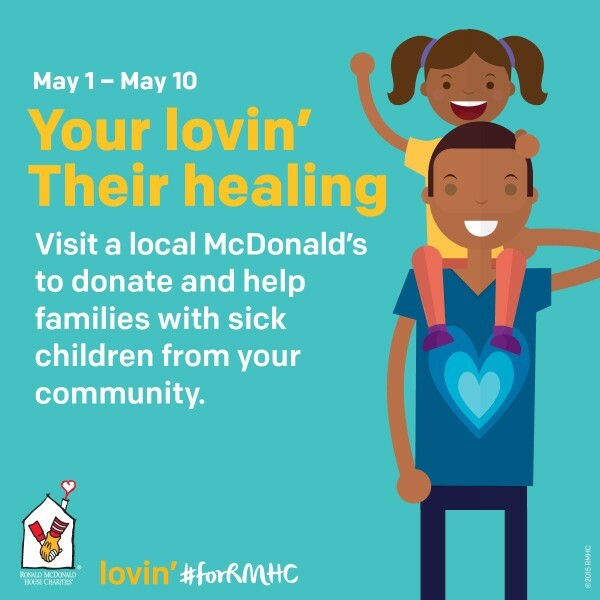 While the Lovin fundraiser only runs through May 10th, you can always make a contribution through the Donation Boxes located inside your local McDonald’s restaurants. Your small change adds up and last year, it helped to raise over $27 million in the U.S. alone! Tell me in the comments what you love about the RMHC! Do you know anyone who stayed at the Ronald McDonald House or used the Ronald McDonald Family Room? I have a friend that was truly helped by the Ronald McDonald house. It’s a truly wonderful charity! Years ago, I had a dear friend whose son developed a brain tumor at 3 years old. The Ronald McDonald house was absolutely incredible and housed them in each and every city they had to travel to for his surgeries and procedures. I fully support this charity and thank God that they are there to help families in need. The Ronald McDonald house is a wonderful charity that is so helpful for so many families. Thank you for all the info and for sharing! I know first hand what a huge help McDonalds is to parents with sick kids. One of my friends has 3 children with cystic fibrosis and McDonalds housed them at the McDonald House so they could stay with their oldest while at the hospital. I will make sure I stop by this week and enjoy a salad and buy a heart. This is a charity that truly gives back to families when they really need it. I love what Ronald McDonald houses do, and I’m honoured to support it! Ronald McDonald house is an amazing charity for families that need it! I know a couple families who had to use it to stay near their kids before. I belong to the Grange a fraternal organization. We collect can tabs for our local Ronald McDonald house in Providence RI. They are wonderful. I will make sure to go to McDonalds so I can support them this way too! Although I do not eat at McDonalds I may just stop in there and buy one of those hearts! I had a premie baby too. 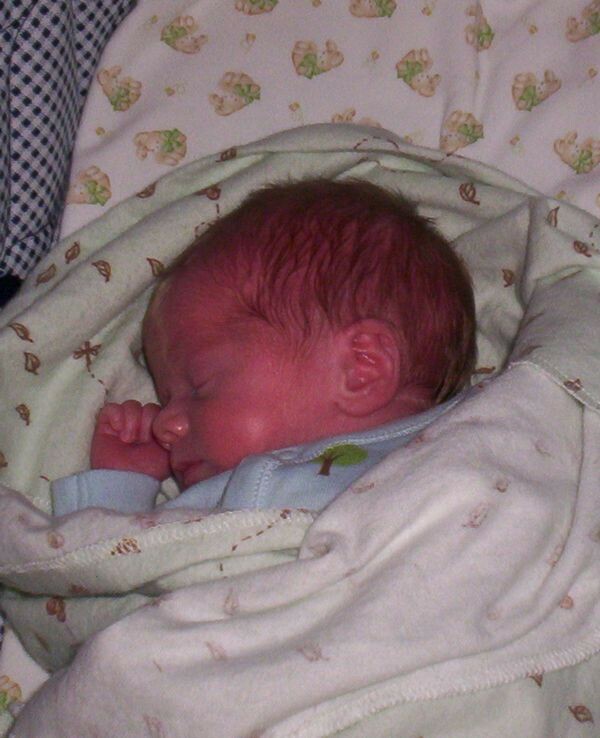 My last was born at 32 weeks and was in the NICU for 19 days. He was born when we were on vacation 700 miles from home. Thankfully we had family to stay with, but yes things like the Ronald McDonald house are amazing! I firmly believe that the Ronald McDonald house is a great organization. I’ve heard a lot of good comments from parents who benefitted from it while I was a volunteer at the hospital. It’s great to be able to donate at McDonald’s. Those dollars add up! Great to see this post giving recognition to The Ronald McDonald House. It truly is a fantastic organization. I’ve volunteered there many times and always walk away feeling like it is helping so many families. We’re lucky to have them in St. Louis. The Ronald McDonald house is such a fabulous organization and I love all the good they do for the hospitals. What a wonderful organization!! I have a few friends that had preemies…it’s such a relief to know that these organizations are out there to help parents out! On Behalf of RMHC.org we would love to work with you. Would you please let me know what is the best way to contact you. omg what a fantastic charity! I haven’t known anyone personally that has been helped by them but I have read so many stories online!!!! The Ronald McDonald House is such a worthy cause and has helped many families through incredibly difficult times! What a great charity. I had no idea that they offered so many types of assistance. The Ronald McDonald house is such a super charity. I know it does help a lot of families and is a great charity to support.